Overpriced, poor quality, desktop picture frames, measuring a scant few inches was all the market had to offer for year after year. So I gave up and that's when it happened. Seemingly over night a whole slew of amazing digital frames popped into existence. They skipped generations of advancement, going straight from expensive digital novelties, to stunning full featured smart frames. So to help you choose your first frame, here are my opinions on three of the best options at the $300, $600, and $900 price points. Guest's Reaction: "Is that a picture frame?" This is Electric Objects second generation frame. Weighing in at just $299 it's their answer to accessible art. It's important to note that the EO2, though very capable of displaying your photos, animated GIFs, and videos, really aims towards bringing art into your home through their monthly subscription service and community driven content. Given that the majority of the Fstoppers community will primarily be concerned with how well these frames display images, I won't delve into EO's services but you can learn more about that here. 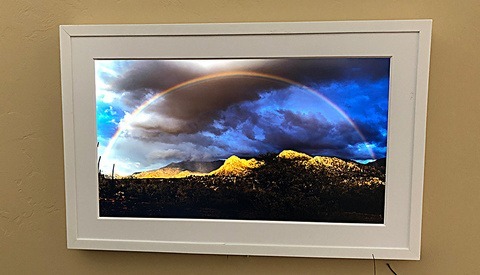 That being said, I found displaying my photos on it's 23" (diagonal), LED-backlit, matte screen, looked good enough to fool the casual observer into thinking they might be a printed image. It's visible power cord can give off a monitor vibe if you don't manage to engineer a way of hiding it. The version I had was a simple, clean, black anodized aluminum frame. I suspect that some of their other frames (like their wood option) would provide an even better framed photo experience. My favorite aspect of the EO2 is it's exceptional build quality and affordable price point. Guest's Reaction: "Looking at paintings on this frame actually makes me emotional." Like the EO2, Meural aims to bring art into your home. They work closely with museums, galleries, and artists to bring you beautiful displays of art, subscription free. 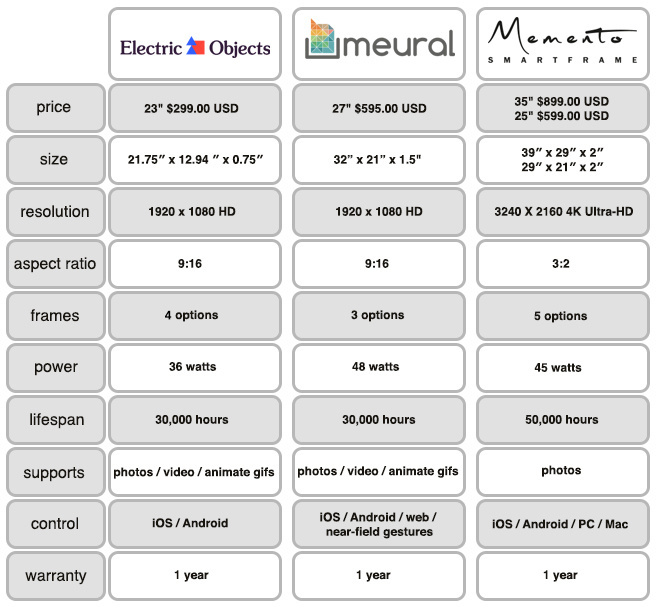 Meural calls it's frame a digital canvas and with good reason. At first glance anyone would be hard pressed to peg this as a digital frame. The Meural really does emulate the look of a print or painting, exceptionally well. To add to it's impressive attributes Meural comes to life through it's near-field gesture interface. Simply waving your hand along the frame's edge allows you to change images, galleries, displayed info and settings. Tuck that cord away and you won't have any regrets replacing your prints and paintings with this new aged canvas. 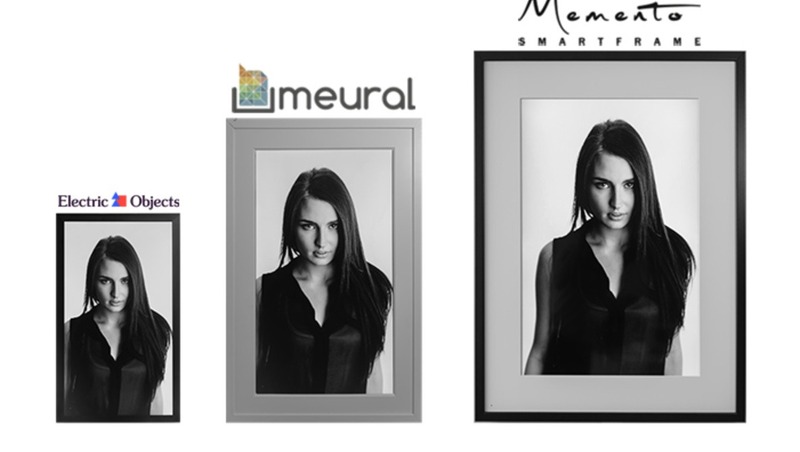 My favorite aspect of Meural's digital frame is it's super realistic image quality and feature rich interface. Guest's Reaction: "Oh my god that's a digital frame? It's beautiful!" Memento blends the past with the present. Of the the three options Memento is the one that puts an emphasis on the photographic experience. Brightness, temperature, contrast, exposure, and saturation can all be adjusted to help you reproduce an accurate image. The massive 35" display is stunning and actually seems to finish a room or studio. It also comes in a 25" model for $599 (29″x 21″ x 2″). When I plan my studio, I envision a series of these frames lining it's hallway, displaying my latest works. Memento's resolution, attention to detail and ease of use all come together to form a true print replacement option. It even goes so far as to address those unsightly, illusion breaking, cords. It may seem like a small thing but when you're trying to replace your analog frames with digital, a dangling cord can be painfully obvious. Memento's Flat Power Cable Kit can be picked up for an additional $79. It's 15 feet of flat wire that can be trimmed down, adheres flat to your wall, and has a textured matte surface allowing you to paint right over it (see the photo below for an unpainted example). My favorite aspect of the Memento Smart Frame is it's how easy it is to use, how it fills a space, and how much impact it gives your images. All three of these frames have a lot going on. Ambient light sensors that dim or brighten the image to maintain a photo realistic image, storage for thousands of photos, WIFI connectivity, energy saver modes, and mobile app supported. Today's frames have finally caught up with the digital age and I for one am very happy to be mothballing my printer for a more enriched photo sharing experience. If you have any questions about these frames just write them in the comments below and I'll do my best to answer them. It's difficult to take your word on this after writing, "stunning high-res cameras in every phone." Maybe saying it's "amazing" would be more on point than "stunning" but that's subjective. Compare Canon's original 5D to today's iPhone 7 camera and I think most people would agree it's pretty damn amazing. But thanks for the, almost, constructive criticism. I suspect ... whatever the pixel peeping suggests ... a good photographer armed with the 5Dc and a decent set of lenses would have any other photographer using just the iPhone 7 comfortably 'on toast' when it comes to the real aesthetic quality of the images they could produce. Time for a 'camera battle' maybe. 12 hours wherever you like ... what can you deliver? 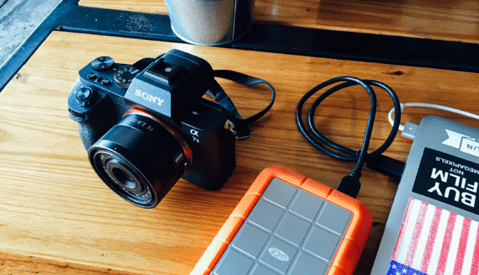 The sensor and lens technology is amazing, but you're right, it lacks the versatility that an interchangeable lens camera affords. If you compared the iPhone 7 against the original 5D with a 28mm f13 lens to match the iPhone, I'd say the iPhone would be the better tool. Likely better image quality, and the size would allow for more unique perspectives. But of course there are very few scenes where a 28mm f13 lens would be your first choice. I print a lot but have only seen the older, cheap digital frames so can't make a valid comparison. I will say, however, I don't believe they could possible have the same effect as good paper but they bring their own unique advantages to the table. Not better or equal...just different. These frames have definitely progressed beyond novelty status but you're not wrong. They're not a point for point replacement for prints. And as Patrick said, digital frames and print, each have their own charms. My question is "if the mfgr of the frame went out of business would I still be able to load and use the frame?" The mfgr's do not make this info easy to find and would enhance your article IMO. Yeah, that's a good point (I think I know what you mean). I've only read the article (which is a great starting point for researching these, at least for me) and viewed a few moments of each respective brand/company's product. But, I'd also be interested in at least one I saw that demo'd an app, and how that'd pan out if someone decided to go iPhone from Android, how's the app's built, who's in charge of those video thumbs (hahaha) for example (or vice versa)... Whatever desktop application and/or any operating system combinations should be cool for a while, it just never gets updated (sort of like still having PS6 still installed one of your old PC laptops that still gets used every once in a while). You could continue using these frames via the apps but in the case of Memento there is a desktop application that operates independently. Obviously updates would stop but I would imagine the application would out live the unit itself. These seem cool... I must've missed 'em at WPPI, would love to have seen a demo. Ideally, seeing them almost anywhere and in person would be best though. I can imagine rationalizing 1 (maybe two...) depending on how it looks and who's manufacturing the units, I think. I would love to see a frame like this in a square format, which would be the least dimensionally damaging to pictures that don't fit well in portrait or landscape presentations. Let the remainder of the screen be black, white, a color chosen by the exhibitor, or even a color automatically chosen by the processor based on each picture's color scheme. Had the 25" Memento frame on an easel on an end table in my living room for a couple of years. I really liked it. Quirky now and then, but not too bad and I suspect they are all quirky. The Screen resolution was great. One day I accidentally knocked it over and (ouch!) broke the screen. I live in the US and Memento is in Canada. They quoted me about $250 to replace the screen but I had to send it up to Canada. It was still better than buying a new one, so I paid $75 in shipping and sent it. They contacted me and told me that Canadian customs wanted $125 customs fee to import it into their country. Import? Huh? Thanks Memento for telling me this upfront! I had them send it back. Wasted $75. I'm looking for a replacement now, but not sure which one. 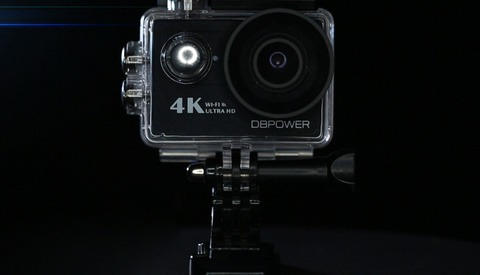 I'm wondering if the 1080 frames are going to look as good as the 4K. I had 2K photos in a slideshow in this frame. Takes 3K total so you won't get bored too quickly seeing the same photos.